Although, Hippocrates, (b. 460 B.C.) was the first to write extensively on spinal deformity, the Greek physician Galen introduced the terms scoliosis, kyphosis and lordosis into medical terminology during the second century A.D. (Huebert, 1967). Hippocrates noted that the severity of the deformity was related to the age at which it appeared, but he was unable to divide the possible causes into more detailed classifications (Adams, 1849). He reported, “There are many varieties of curvatures of the spine even in subjects who are in good health, for it takes place from natural conformation and from habit, and the spine is liable to be bent from old age and from pain.” (Adams, 1849). 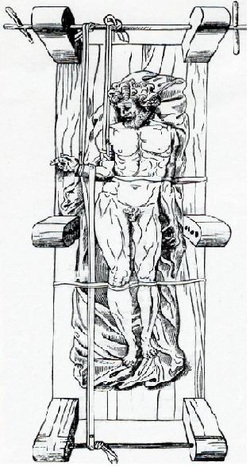 The concept of longitudinal traction as the primary treatment mode was introduced by Hippocrates and later used by Galen, (figure 3.1). Moe’s textbook of scoliosis and other spinal deformities. Ambrose Pare (1634) is credited with being the first physician to apply an orthosis, which in reality was a metal corset made by an armourer. Pare (1634) realised that when a person with scoliosis reached skeletal maturity, bracing was not useful. In 1945, Blount introduced the Milwaukee brace for post-operative immobilisation of scoliosis patients, which was soon adapted to the non operative treatment of spinal deformity (Blount, 1958). Between 1780 and 1880, over 100 different orthopaedic methods or means to correct scoliosis were introduced, which today have been abandoned. These apparatus worked according to three principles (Rigo, 1997). At the end of the 18th century, English army officers imported the moulded plaster technique from the Arabs. Sayn made the first plaster brace. The majority of teams from different countries applied the correction principles of lateral pressure, using “frames” for this purpose. The frame described by Abbot (1912) in Portland, introduced derotation forces to correct rib hump. Abbot was also the forerunner in the so-called expansion rooms, at the level of the concave areas of the trunk, with the aim of achieving hypercorrection (Wood and Rigo, 1999). No one apparently followed-up this idea until the end of the seventies, when Jacques Chêneau of Toulouse used it to construct a derotation brace in polyethylene, presented by Prof. Matthiass of Münster in 1979, as the Chêneau brace (Matthiass et al., 1979; Cahuzac et al., 1993). The brace has also been named the C.T.M. brace (Chêneau-Toulouse-Münster) in which Dr. Chêneau of Toulouse, inspired by Abbot, fabricated the original Chêneau brace. During the past few years, Dr. Rigo of Barcelona has furthered the development of the original Chêneau brace by combining his new classification of scoliosis, to design the Rigo Classification of scoliosis and brace design. The three-dimensional nature of scoliosis has been known since the 19th century. John Shaw recognised it in 1824 and clearly demonstrated that the apex of the deformity is lordotic, with the anterior column longer than the posterior column (Wood and Rigo, 1999). Adams (1849), also described the presence of lordosis in the thoracic apical region. Jean Dubousset, a prestigious French surgeon recently wrote, “with the arrival of radiology in 1895, the anatomical observations made by Shaw and Adams were quickly forgotten. The projections of the skeleton produced by X-rays were so attractive for doctors, surgeons, etc…that their thoughts were concentrated only on what was projected, the anteroposterior view and rarely the sagittal view. As a result of this unidimensional approach, errors occurred in the use of instrumentation systems of the spine, creating the lumbar flat back syndrome, for example. This occurred throughout the world, in spite of the efforts made by Roaf and Sommerville in their persistent description of the 3D nature of the scoliotic deformity. Dickson has recently underlined these finding of his British colleagues. In France, Rene Pedriolle was a pioneer in promoting the reality of the tridimensional nature of the deformity.” Dubousset (1992). Within this uni-plane or bi-plane maximum context and for those who at least consider rotation, during the last 60 years a series of orthopaedic apparatus have been introduced to treat scoliosis and which are now considered standard. From the Milwaukee brace, introduced by Blount and Schmidt in 1945, as representative of a cervicothoracolumbosacral orthosis (CTLSO), to the Boston brace, as representative of a TLSO. Plastic braces of the Lyon School and Charleston bending braces have significant effects in the treatment of scoliosis (Rigo, 1997).